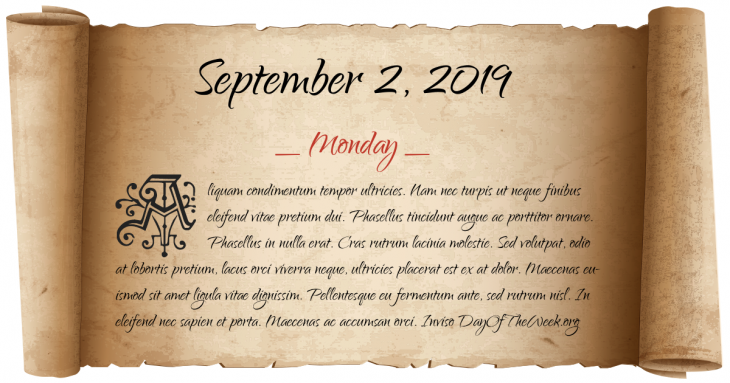 What Day Of The Week Is September 2? Emperor Constantius III dies suddenly of an illness, his wife Galla Placidia becomes for the second time widow. American Civil War: Union forces enter Atlanta, Georgia, a day after the Confederate defenders flee the city. The Interim Government of India is formed with Jawaharlal Nehru as Vice President with the powers of a Prime Minister. President Ngo Dinh Diem of South Vietnam becomes the first foreign head of state to make a state visit to Australia. CBS Evening News becomes U.S. network television’s first half-hour weeknight news broadcast, when the show is lengthened from 15 to 30 minutes. Nagorno Karabakh declares its independence from Azerbaijan forming the Nagorno-Karabakh Republic. Who were born on September 2?